"The best of times is now. What's left of summer but a faded rose? The best of times is now. As for tomorrow, well, who knows? So hold this moment fast, and live and love as hard as you know how, and make this moment last, because the best of times is now." This lyric from La Cage aux Folles is at the heart of the show, and a big heart it is. Yes there are lots of feathers and glitter and make-up in this story that takes place in a nightclub featuring men in drag, but underneath it all is a beautiful, simple, family love story. It may be an unconventional family by society's standards, but the love and support they share are universal. 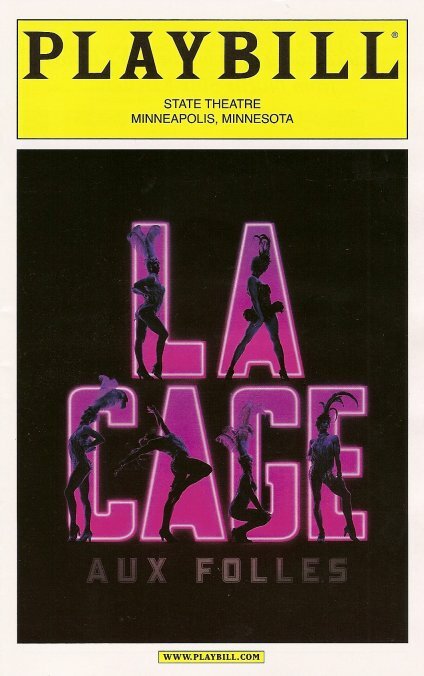 If you've seen the 1996 movie The Birdcage starring Nathan Lane and Robin Williams you're familiar with the story, which began as a 1973 French play called La Cage aux Folles. The musical version of the play was written by Harvey Fierstein (book) and Jerry Herman (music and lyrics) and premiered on Broadway in 1983. It has been revived twice in the past decade, winning a Tony for best revival both times (the only musical do have done so). La Cage tells the story of gay couple Georges and Albin. Georges runs the nightclub where Albin is the star, performing as his alter ego ZaZa. Georges' son Jean-Michel, whom Albin has helped raise, comes home to announce that he's engaged to Anne, the daughter of a conservative politician who wants to shut down all drag entertainment. The in-laws are coming to town, and Jean-Michel asks Albin to leave for the evening, instead inviting his birth mother to pretend that they're a "normal" family. Albin is understandably hurt that the man he considers his son is ashamed to introduce him to his fiance. He can't stay away, and poses first as "Uncle Al," and then, in drag, as Jean-Michel's mother. Of course the deception doesn't last, but they're able to convince Anne's father to give his consent with some good old-fashioned blackmail. Jean-Michel realizes what a mistake he made and tells Albin he thinks of him as his mother. And they live happily ever after, for "the best of times is now." 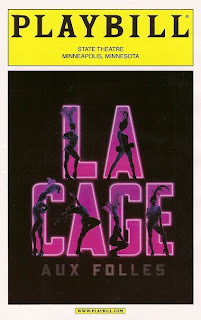 La Cage closed on Broadway in May after about a year's run (I thought about seeing it when I was in NYC last year, but never quite made it), and this first tour is spectacular and features several cast members from the Broadway run. The role of Georges is played by TV and film veteran George Hamilton. He's a perfectly adequate Georges, and considering his age (72), it's pretty remarkable that he's on the road doing this eight times a week (even if his spins are a little slower than the rest of the cast). But the star of the show, and its heart and soul, is Christopher Sieber as Albin. His performance is fearless, tender, funny, heart-breaking, and inspirational (and he's from Minnesota, which of course makes me love him more!). Through him we feel Albin's insecurity that's forgotten only when he puts "A Little More Mascara" on. Albin's transformation from utter devastation upon learning his son has rejected him to a fierce cry of self assurance in "I Am What I Am" is a show-stopper moment. He brings such natural charm and humor and emotion to the role, it's a thing of beauty to watch. Chris played Georges on Broadway opposite Harvey Fierstein, but it's hard to imagine him as anyone but Albin. He's not a two-time Tony nominee for nothing, and I'm grateful he brought his considerable talent home to Minnesota if only for a short time. The large supporting cast is great. Jeigh Madjus as Albin's butler/maid Jacob is an irresistible little scene stealer, prancing around with attitude, just waiting for his shot on the nightclub stage. And of course this post would not be complete without mentioning the Cagelles - the eight fabulous men who dance around the stage in heels, wigs, and hose. They are all incredible performers, dancers, and athletes (although some make more attractive women than others ;). It goes without saying that the costumes are fantastically over-the-top. This show makes you fall in love with this family and forget that they don't meet the traditional definition of family. More than 30 years after the original play was written, one would hope that some of these ideas of prejudice seem archaic and today's society would be more accepting of an atypical family. Maybe that's why it's been revived twice in recent years, because we need to hear this message in a non-threatening musical comedy way. After all, who could argue with the sweet and long-lasting love between Georges and Albin and their son? La Cage is playing at the State Theatre (slightly smaller but no less beautiful than its sister theater up the street, the Orpheum) for only a week. So get your tickets now if you want a fun, fabulous, entertaining evening with lots of heart. Thanks for the review. I plan on getting student rush tickets on Saturday and I'm so excited. I'm a huge fan of the film and so the broadway show should be fun. Definitely regretted missing it's opening while I was in NY!